The name is a misnomer. Far less than 1 percent of Dinosaur National Monument has anything to do with Barney’s brethren. 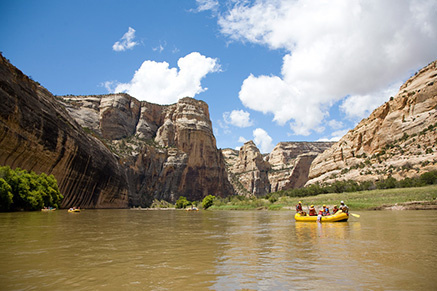 The bulk of this northwestern Colorado reserve protects the wilderness canyons of the Green and Yampa rivers, and the best way to experience them is by water. Following in the wake of a pioneering 1928 Denver Post party, I signed up for a five-night, 72-mile run down the Yampa led by OARS, successor to the company founded by the Post party’s guide. Our journey, the longest commercially guided river trip in Colorado, begins at Deerlodge Park on the eastern edge of the monument, 60 miles west of Craig. Our flotilla consists of three rubber rafts, one Grand Canyon-style dory and a trio of inflatable kayaks known as duckies. Unlike alpine streams where rapids arrive in Gatling-gun succession, the Yampa’s whitewater comes separated by stretches of relaxing, flat flow. We follow the canyon’s meandering turns, float by towering overhangs and pass countless sandstone walls streaked with desert varnish. Songbirds chirp, raptors soar and beavers swim by, their heads barely clearing the water. Time flows at the pace of the current. Camp life follows a predictable pattern. Upon landing, we passengers storm ashore like sailors on leave. After picking a choice site on the riverside bench, we return to the rafts to unload the bags holding our personal belongings. While we erect tents, roll out sleeping bags and pop open beer, our four-man guide crew begins preparing dinners, which range from grilled salmon and barbecue chicken to rib-eye steaks. Cliffs soon blush in the sunset light with moon and stars to follow. Most of the Yampa whitewater ranges from easy splashers to Class III churners. The canyon’s signature rapid is Warm Springs, a solid Class IV plunger. At high water, it offers a pair of “holes” where water crashing over submerged rocks hurtles back upstream to form swirling pits of agitated chaos. One private group had their raft flip in Warm Springs’ first hole, sending oarsman and passengers on an impromptu swim. Miraculously, when the boat hit the lower Maytag hole, it righted itself. All of our group, fortunately, scream through sunny-side up. The Yampa River soon meets the Green River in Echo Park. Beyond, we enter Whirlpool Canyon, where human beavers from the Bureau of Reclamation once proposed building a massive dam that would have turned the remote canyon we just floated into a bathtub-ringed houseboat haven. We cross the state line, celebrating our entry into Utah that evening with cans of Colorado-bought non-3.2 beer. After a few rapids the following morning, the river begins a five-mile meander to Rainbow Park and the Island Park Fault, a curving uplift that arcs like a ruddy rainbow. Rather than flow around, the river slices through this obstacle to form Split Mountain Canyon. We plow through, running one named rapid after another. The fun abruptly ends. The cliffs drop away and the boats pull ashore. Bags are unloaded, goodbyes said, and we pile into a van that takes us back to town. Unlike that 1928 Post party, we lost no food, no camping gear and no cameras, and we sunk nary a boat on our adventure.